Peering up the 40 percent incline of the monumental sand dune in Valle del la Muerte, I told myself the views would be worth the climb. 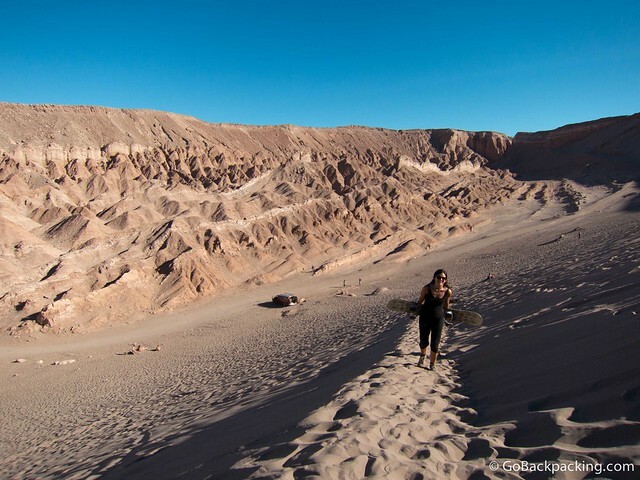 I didn't know much about northern Chile before my arrival, but I knew I wanted to go sandboarding in the Atacama Desert. I grabbed a snowboard, and began the slow slog up as Guns ‘n Roses blasted from the tour van's stereo system. 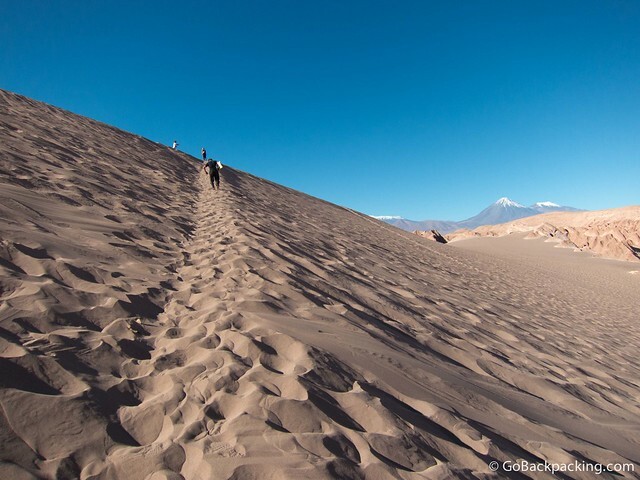 Climbing sand dunes at the beach is hard enough, let alone 2,400 meters above sea level in the middle of the dryest desert on the planet. But climb I did, along with a dozen other travelers, each of whom paid $20 for the experience. One step at a time, slowly but surely, we made our way up the dune with our snowboards. From the top, we had incredible 360-degree views of the Martian landscape. Rising thousands of feet into the air, the two snow-capped volcanoes were the most striking feature on the horizon. 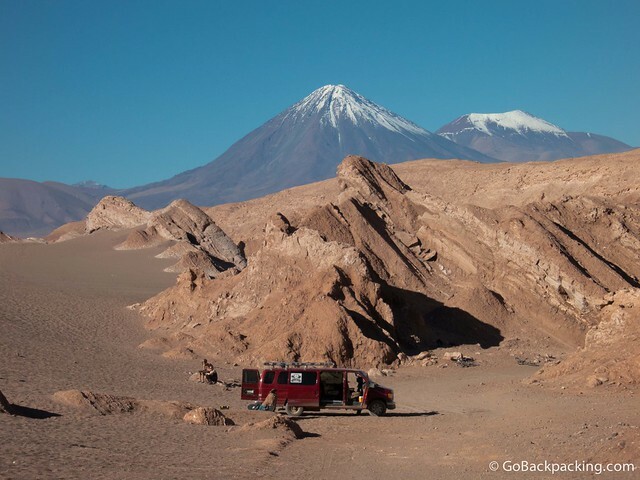 I'd first seen them the day before from the streets of San Pedro de Atacama, but the added height of the sand dune, gave me a new appreciation for their grandeur. Running along the opposite side of the valley from our sand dune were striated rocks. Our guide handed out wax, and we began rubbing it on the base of our boards, the same way you would if you were going snowboarding or surfing. The wax smooths out the surface, which decreases the friction between the board and the sand. In sandboarding, unlike the other sports, you have to wax your board before every run, or you'll barely move. The combination of intense sun, sand, and wax reminded me of my first experience sandboarding in Jeffrey's Bay, South Africa. I was alone on that occasion, on a much smaller dune, though it was just as hot. Once the board was waxed, I strapped myself in, and made sure someone got a photo of me this time. Modified bindings allowed us to use our own close-toed footwear. My Merrill sneakers worked fine, though you do feel a little less stable without boots that support your ankles. 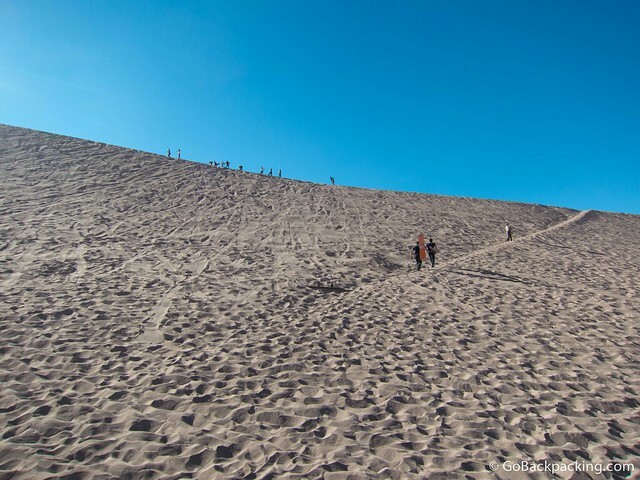 The next step is to point your board straight down the 150-meter long dune, and lean forward. In theory, it sounds simple, but when you're up there looking down a 40-degree slope, the thought of going straight is a little more anxiety-provoking. All the same, I'd done it before, and had snowboarded for many years before, so I dropped in and made a few turns before my first fall. A cloud of red sand erupts around me. Sand I knew I'd be washing out of my ears, nose, skin and clothes for days to come. To be completely honest, the payoff for climbing the dune isn't the few seconds riding down, but the views you get up there. It's the atmosphere of watching others give it a try, and the punk rock music filling the valley below. It was so exhausting, I only took two runs, and climbed a third time with just my camera to get photos. Sanboard San Pedro offers morning, afternoon, and even night trips. 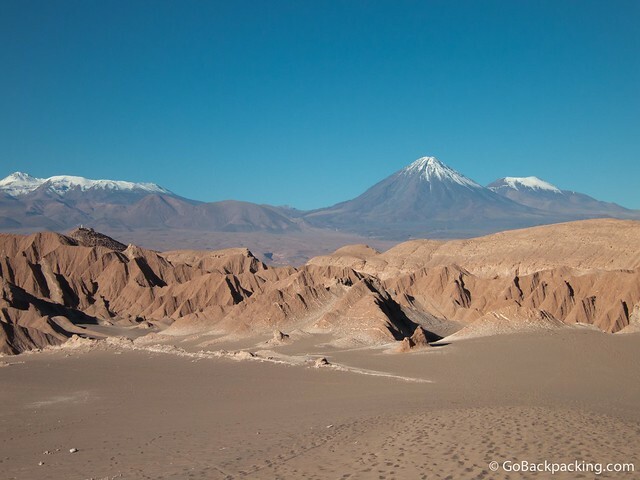 I recommend the afternoon trip, which starts around 1pm, because you'll be able to catch the sunset from the nearby Valle de la Luna (Valley of the Moon). Have you been sandboarding? Share the location in the Comments below! It’s easier if you’ve got snowboarding experience, because you’ll already be familiar with the basics of turning. But no, it’s not that hard. It’s exhausting climbing the stupid dune, so for me, it was more about the scenery then actually putting a run together without falling. Sandboarding is a blast but nothing compared to snowboarding. It looks like it’s worth the climb just for the views alone! Agreed, snowboarding is WAY more fun! hello Dave i enjoyed you post very much and i want to ask is this as smooth as snow or you have to put some extra to enjoy it. No, the sand creates A LOT more friction with the bottom of the board, which is why you have to wax it after every run. You’ll never get going as fast as on snow for the same reason, which is why it’s cool to try once or twice, but not something I’d want to do regularly. Do you have to schedule sandboarding ahead if time or can you simply go straight to San board San Pedro and buy your tour on the spot? There’s no need to book ahead of time, several companies run the sandboarding trips daily as long as there’s enough demand.